What do you want your Australian adventure to deliver? Cool city living? Captivating wildlife? Superb beaches? Tonnes of adventure? The southern state of Victoria has it all. Melbourne is the jewel in Victoria’s crown. It’s a magnet for a trendy laid back crowd and rich in arts, live music, chilled out cafes and some of the best (if not the best) shopping in Australia. This amazing city maybe one of the top ‘must visits’ for any self respecting traveller but isn’t all Victoria has to offer – not by a long shot. And on that note, let me introduce you to Kathryn, 27, from Nottingham. She can’t help but sing the praises of Victoria. She loves it, and she tells us why below, in the hope that she can inspire you to experience it for yourself. I was collected from my hostel in Melbourne at 11am by a tour bus heading to Phillip Island. It was a Wednesday and this was to be another great day out in Victoria. Straight away I got talking to some of the other passengers. There was a girl from Hong Kong, a guy from Nepal (I’d never met anyone from Nepal before), a Finnish girl and a Dutch and Spanish girl who were staying in the same hostel as me, we were all buzzing with excitement as we made our way to Phillip Island and swapped stories of our travels along the way. First stop was the nature park. We met some cute koalas and I learnt that the word koala means ‘no drink/no water’ in Aboriginal language as koalas don’t need much liquid to survive. Then we saw carnivorous Tasmanian devils being fed raw meat, they are almost blind and have to rely on their other senses, it was intriguing to watch. There were loads of other animals at the park too, including alpacas, wallabies, kangaroos and emus, seeing animals like this was one of the reasons I wanted to come to Australia, it was a huge thrill. Later, we stopped at a gorgeous beach, as we were driving towards what was to be the highlight of the tour, our guide pointed out wild wallabies roaming near by, it was so exciting. Later, we sat in the sand and stared out to sea waiting for the little penguins of Phillip Island to venture onto the sand. They only leave the sea at night time after a long day of hunting fish, as predators are less likely to be around. We’d been sat for an hour and a half when, in the dim half light, I saw a group of little penguins coming out of the sea, then going back in again, then coming out (they may even have been “shaking it all about” but it was too dark to tell for sure!) It was incredible and something I’d been waiting my whole trip to see. They waddled up the beach towards the overgrowth and crowded around to try and catch a glimpse of them in the bushes. We got close to one who seemed to be hiding behind a bush, so we backed off to make sure we weren’t scaring it. As we walked back to the bus we saw loads of little penguins all around, they were so cute and furry. At one point the park rangers halted us on our footpath and told us to stand behind a white line so a couple of penguins could cross. They have right of way on Phillip Island and who would want to argue with that. I couldn’t believe, after years of watching “Neighbours” on TV, that I would actually be visiting the set. I was so happy as I handed over my tour voucher that I gave the biggest cheesiest grin of my life! First we journeyed to Erinsborough high school, whilst being filled in on interesting Neighbours facts, my favourite being that Erinsborough is actually an anagram of Neighbours. 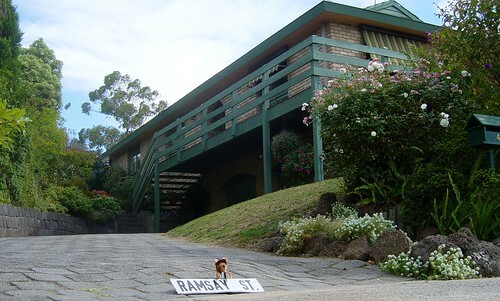 Ramsay Street is a lot smaller than it looks on TV. There are only six houses on the street, numbered 1 to 6, but on the soap the houses are numbered in there 20s to give an impression of a big cul de sac. We were only allowed to walk on the pavement and road. We weren’t allowed onto the gardens of the houses as they are private property and there are people actually living in them. After visiting the street we met an actress who had previously played Janelle Timmons. She talked to us about what it was like to work on Neighbours, which for a fan like me was a massive thrill! That afternoon, after the excitement of my Neighbours experience, I went for a walk around one of Melbourne’s many grassy parks. When the sun is shining Melbourne is such a beautiful place. I randomly spotted a guy called Tim who had been on my Indochina Experience trip in Southeast Asia. We went for a coffee and a caught up on the many travel experiences we have enjoyed since our tour had ended, it was the perfect day.